Introduction: Evaluation of the learning curve of robotic surgery has shown reduced errors and decreased task completion and training times, as compared with regular laparoscopic surgery. However, most training evaluations of robotic surgery have only addressed retention in less than a month after completion of training. Aim: Our goal was to investigate the amount of surgical skill retained after 3 months of training with the da Vinci Robotic Surgical System. Methods: After completing an initial training program, the participating medical students were tested for retention after one day, one week, one month, and 3 months. To quantify retention both objective and subjective parameters were tested. A repeated measure ANOVA was used to determine statistical significance. Results: Time of task completion was decreased from pre- to post-training (p=0.007) and was retained from pre-training to all the corresponding retention periods: 1day (p=0.003), 1week (p=0.005), 1month (p=0.005), and 3months (p=0.007; Figure 1). The total distance traveled did not show significant difference between pre-testing and any retention tests. The modified objective structured assessment of technical skills (OSATS) for robot assisted surgery showed improved performance from pre-test to post-test (p=0.002) and all the retention tests maintained this improvement (Figure 2). Participants reported familiarity, increased self-confidence and mastery to perform robotic surgical tasks after training. 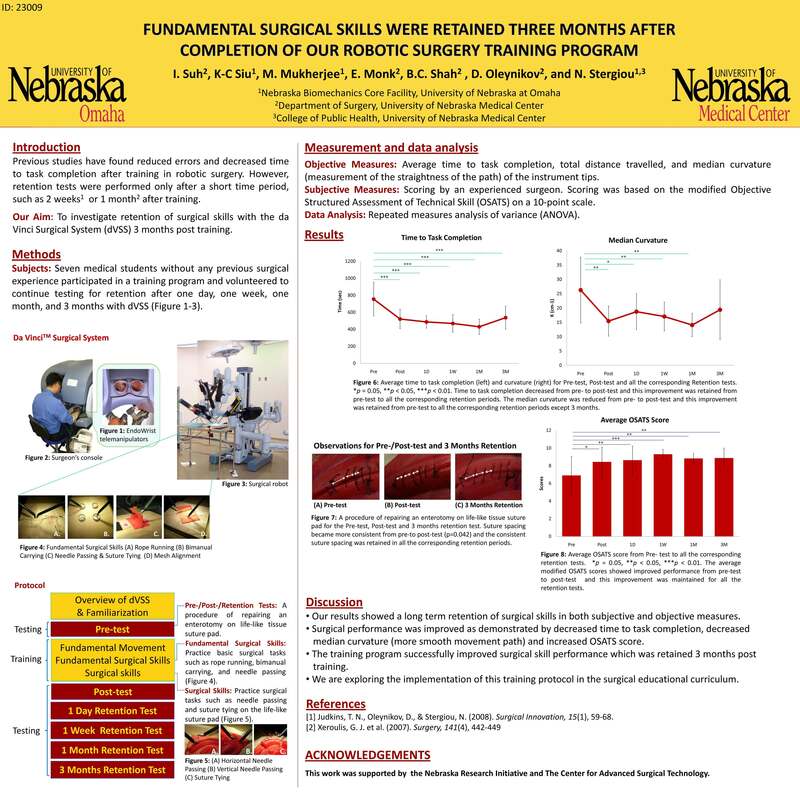 Conclusions: All medical students retained their fundamental surgical skills 3 months after receiving the robotic surgical training program emphasizing the quality of our training protocol.